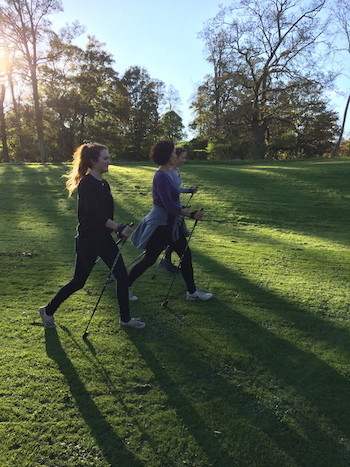 Nordic Walking East Anglia was set up and is run by two friends, Mary Tweed and Katharine Green, who both share a passion for outdoor exercise. They are both qualified instructors trained in the British Nordic Walking 10 step teaching programme. Nordic Walking is the fastest growing form of fitness in the UK and is a technique of walking with specially designed Nordic Walking Poles, derived from cross country skiing, which delivers a full body workout in a manner that is sociable, outdoor and fun and can be adapted to be enjoyed by a wide range of people regardless of fitness level, age or gender. Weight Loss You can burn up to 46% more calories than with ordinary walking by using the poles. By spreading the effort across 90% of your skeletal muscles you do not perceive the increased effort. Tone your upper arms and trim your waist. Posture and Tension: The technique emphasises a good posture and involves rotating the shoulders. This helps you release tension in the neck and shoulders and relearn the best posture for your body. Strengthen your back and abdominal muscles. Reduce the impact on the joints. The poles bear the impact of walking, not your joints. Being a weight bearing exercise, it is excellent for bone health.